Anytime is the perfect time to tell him how much he is appreciated, and what better way to do that than with a large basket filled with a huge selection of guy favorites. Whatever the occasion, this manly gift basket filled with delicious nuts, sauces, rubs, snacks, sweets, cheeses, crackers and more will thrill the king of the grill in your life. What guy would not LOVE this basket piled high with so many delicious guy favorites. It is a very special gift that we are positive he will love. 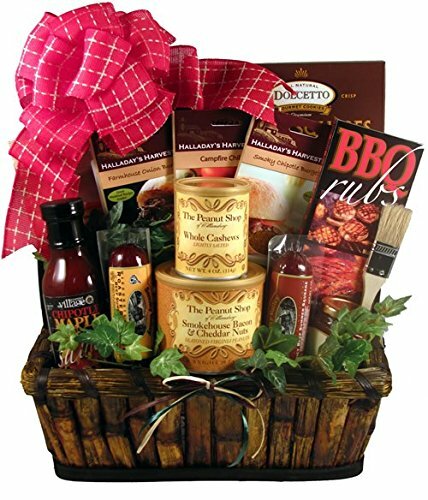 This gift basket for men is perfect for any man who likes food and to cook outdoors over a fire. Okay, that does describe most men so why not treat your favorite guy to something nice? Something nice that he can eat, that is.